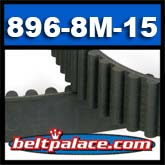 896-8M-15 HTD Heavy Duty Timing belt. Premium 896mm L x 8M x 15mm W.
896-8M-15 HTD Heavy Duty Timing belt. 896-8M-15 (HTD) Industrial Grade Heavy Duty Timing belt. Spec: 8mm Pitch X 15mm Width X 896mm Length OC X 112 Teeth. * CALL FOR SCHWINN PART 95513 for newer Airdyne Evolution Pro/Comp (Short Fan).